Lots of fun, lots of double decreases. Because I like them. I toyed with the idea of making a non-double-decrease version, but had other more urgent kitsch to attend to at that point. 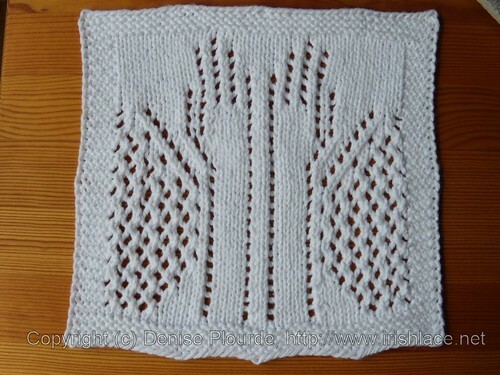 And I have a single-decrease variation of the Blink Washcloth available at the bottom of the pattern page. Hello! I've got a question re: the original 'Blink' pattern -- I can't seem to get past Row 10 without losing or gaining a stitch somewhere (usually losing it). I start row 10 with 45 stitches, paying careful attention to the decreases and yarn-overs, but at the end of the row, I have only 44 stiches on the needle! I tried working from the written instructions, then tried working from the chart, but I get the same result. Any ideas on what I'm doing wrong? I've reviewed the chart and the written instructions, and I'm not seeing any errors in row 10. (Mistakes, they happen.) Anyway, the instructions themselves look good, so now I get to speculate as to where you are deviating from them. In my experience with centered double decreases (slip 2 together, knit 1, pass 2 slipped stitches over), if there is a yarn over immediately after it, I will tend to omit it. I have no idea why I do this, but if I'm short a stitch on a row that has yo-cdd-yo, it is almost always a missing yo immediately after the cdd. If I were gaining a stitch on that row (or on 14 or 18 or 22...), it likely would be because I missed the ssk hidden in the border on the right. It's subtle, it's discreet, it's sneaky, and it's easy to overlook when doing k,p,k,p,k on autopilot. As to what you're doing... When you get to the end of row 10, if you have the wrong number of stitches, count in 11 stitches from each edge. Stitch 11 should should be one plain knit stitch past a yarnover on each side. If it isn't, that's your starting point. Are you at two plain knit stitches on one side? If so, you missed a yarn over. Are you at the yarn over? If so, you missed a decrease. So you know (generally) what you missed, and you know which side you missed it on. At that point, it should be pretty easy to figure out exactly what you missed and where you missed it. If this doesn't help... Can you take and post a photo of what you've got? thank you! I counted back like you suggested on row 10 and I do believe I missed that yarn over after the CDD. I will have to 'frog' and start over but that just means I get more practice, ha ha. 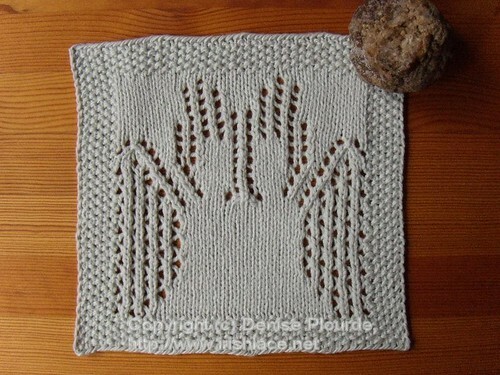 I'm hoping to have a good washcloth befor the end of the month, as I'm hoping to give it to one of our ladies at my church for her 100th birthday. But I will take a pcture to show you. Thank you again! Hello again.... sorry to be such a bother, but I have another question -- about Row 30 of the original "Blink" pattern. Anyway, in Row 30: does "k2tog2" mean "knit 2 together twice", and "ssk2" mean "ssk twice"? Because that's what I did, and ended the row with only 43 stitches! I almost cried, because it had been going so well (other than the occasional problem with psso's because apparently I knit rather tightly, making psso's tricky!) and when I tried to un-knit the row back to where I thought I might have missed a YO --- well, it didn't go very well and I ended up frogging the entire piece (again). So, before I start over (again), could you let me know if I'm reading those instructions in Row 30 correctly? Thank you, and again, I apologize for asking what is probably very obvious and basic to knitting. Mary, first, you aren't clueless - you're asking really good questions. k2tog2 is shorthand for k2tog, k2tog. Likewise, ssk2 is shorthand for ssk, ssk. I'm going to rewrite those to use the word 'twice', since that should make it a bit clearer. That doesn't really help you, though, since you were reading it correctly. If I were short a stitch, it would almost certainly be the last yo before the k15. If I were short two stitches, I'd be looking for the yo at the other end of the k15 and the yo after the ssk,ssk. Those would be the three yos that would give me grief. At that point, I find a stitch-by-stitch stitch count to be helpful. I've bolded a few stitches: those would be the ones I would do a count on. I'd check to see if I have the right stitch count before going into that yo-dec-dec-yo, in the middle, and afterwards. Also... Have you heard of lifelines? They're really useful when knitting lace. When you're at a part in the pattern that you know is right (say, you've just done row 29), you take some smooth fine thread (crochet cotton is good, so is unwaxed dental floss) and run it through all the stitches, following along where the needle is. And you leave it there. Then, if you need to rip back, you know that that lifeline will stop you before you go too far. Fingers crossed, and let me know if you still have questions. Thank you so much for taking the time to set me straight! I'd wanted a knitting challenge (be careful of what you wish for, eh?) and it certainly looks like I found one! As I mentioned, I was pretty sure that I missed at least one YO but it all fell apart when I tried to un-knit the decrease stitches. I'd never heard of the 'lifeline' technique before; I will definitely give it a try next time around. Lace-knitting is certainly not for the absent-minded, is it? Thank you again for your patience and kindness in in helping this 'lace-newbie'!